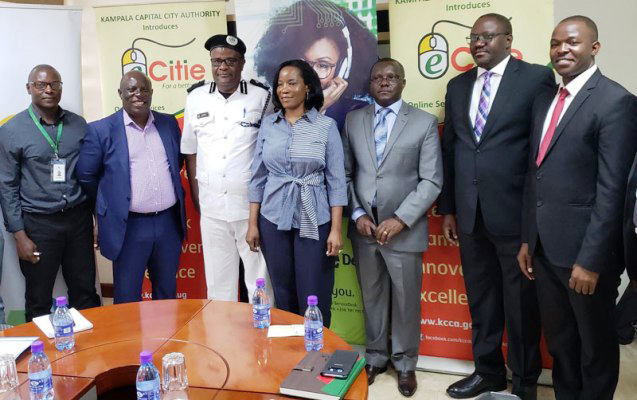 Kampala Capital City Authority (KCCA) has launched a pilot traffic control centre with which they will reduce excessive congestions in the city centre using CCTV cameras. KCCA Executive Director Jennifer Musisi said the pilot exercise, which is being supported by the World Bank, builds on her seven-year efforts of trying to address the challenge of traffic congestion in the city. She said the traffic control centre will complement her other efforts of widening the roads and creating walk ways for pedestrians. She says that the centre is currently used to monitor traffic at the 12 out of the 24 signalised junctions through surveillance cameras which include Kabira 1, Kabira 2 , Kira road police junction , fairway junction, bwaise junction, Jinja road junction, Makerere main gate, Gadaffi road , Kyadondo roao, Sir Appolo Kaggwa road, Nakulabye junction and Bukesa Mengo S.S. According to KCCA ,the centre will also be used to remotely monitor and manage the performance of the traffic lights and this will be done through a radio network communication of the field activities for traffic wardens, ambulances, enforcement and staff of security personnel. The head of traffic police in Uganda Dr. Steven Kasiima applauded the project saying that the officer in the control room will be empowered to change the way traffic lights work to clear very long jams, as opposed to the equal allocation of time for traffic from different directions. In addition, Kasiima says that traffic flow will change especially when it rains but also during the peak hours of morning and evening. KCCA is also planning to scale-up the project to reach 75 more signalised and connected junctions in the next four years. The pilot project as well as the proposed extension will be funded by the World Bank, the Japanese government, among others.